"From its humble beginnings as JackDeth's World, a hobby site for Mustang owner Dan McClain, the Mustang Works grew to become a late model Mustang mega site and now, following its recent renovation, is fast becoming an important electronic alternative to the Mustang mags on the news stand." "Kind of an amusing intro to this pretty nifty Mustang site. Jam-packed with Mustang info, technical Q&A, classified ads, a message board, and even a chat. Worth the trip." Our sites have been awarded as one of the best car sites on the web by CarAward.com. Car Award is a web site that indexes quality automotive sites and awards the best. They also allow users to rate the sites they add to their index, like the rating selection on our main page. Their site designer recently communicated to us, "Keep up the good work, I love your sites." "Top rated among Ford web sites...."
Are we missing an award? If you know of something we've been awarded, and we don't have it here, please Email us. 11/99 More 5.0 Mustang Coverage! 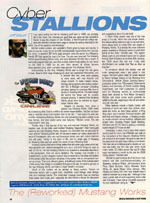 News about The Mustang Works' new look and design has appeared in the "5.0 News" section within the new January 2000 edition of 5.0 Mustang Magazine. They've even printed a nice scan of the site's creative artwork from our 1999 Media Kit. In addition, Jeff Chambers, the moderator of our Head's-Up and Fun Ford Weekend online message board forums (and top ranked Trophy Stock racer! ), was pictured and mentioned in this issue, as well. Appearing with him are Mustang Works fans, Larry Felts, Bruce Winn, and Kevin Enlow. A big thanks to all you guys for your support of the site! You can find them in Dr. Jamie Meyers "Race Notes". Once again, we'd like to extend a huge thanks to the staff of 5.0 Mustang for their continued support! 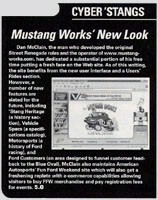 "Of course, the new Mustang Works is too massive to adequately describe in a few paragraphs..."
Mustang Works Editor, >Dan McClain, appears in December 1999 issue of 5.0 Mustang Magazine. A picture of him standing with his car, Project: Death Machine, is shown at the end of a feature article covering the 1999 Norwalk, Ohio Fun Ford Weekend event. A caption above the photo snapped at the event, says "Here he is, Dan McClain, the man behind the biggest Mustang Internet site in cyberspace, The Mustang Works (www.mustangworks.com). Dan learned everything about Mustangs the hard way - he built one. His GT will be running a stroked 351 and Paxton NOVI 2000 supercharger by the time you read this." In addition, the article also mentions how every Trophy Stock racer at the event put MustangWorks.com logos / decals on their race cars. One by one, as they came to the line to race, MustangWorks.com was found on all of them. The founder and editor of The Mustang Works, Dan McClain, gets mentioned in a feature article in the March 1999 issue of 5.0 Mustang Magazine entitled "The '98 Racing Year in Review - Part 2: Life Beyond Pro 5.0". The Mustang Works has been featured in one of the national Mustang magazines! You can read about The Mustang Works, and the other sites discussed, in Petersen Publishing's October Issue of 5.0 Magazine! 05/98 MWorks Editor in 5.0 Mustang Article. The Mustang Works founder, Dan McClain, appears in the Race Notes column in the July issue of 5.0 Mustang concerning the newly created Street Renegade class. The newest addition to the Fun Ford Weekend lineup. Check out the specific section by clicking above, or the whole column by purchasing the July issue of 5.0 Mustang!